If there is one lift that is hard to understand and get the grasp of, it’s the deadlift. Picking a bar up from point A to point B seems simple enough, but, there is a lot of stuff that gets messed up between the start and the finish. 1.) Fix Your Set Up: If I had to put a number on it I would say 8 out of 10 screwed up deadlifts I see start before the bar even moves. The set up for me is the single most important part of the deadlift, it must be understood and executed well for the lifter to stay safe and get strong. 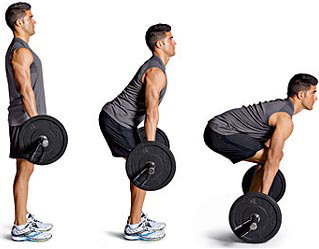 It’s not a squat: I have heard some people describe the deadlift as a squat from the floor. The deadlift is a hip hinge. Think about pushing the hips back and gathering tension in the hamstrings. Hand Placement: Keep the hands right on the outside of your legs in a conventional deadlift. Many lifters tend to go to wide, making it harder to keep the chest high, as well as making the lift more difficult than it needs to be. 2.) Engage the lats: The lats are crucial to having a strong deadlift. To engage the lats think about pulling your shoulder blades down and back. By keeping these packed down, the lats will be under tension during the lift, and help keep the torso ridged throughout the movement. 3.) Be Patient: The bar isn’t going anywhere, so relax. In my experience when people try to rip the bar off the floor, two things tend to happen, the hips shoot up way to early and the back gets rounded enough to be mistaken as a rainbow. Be patient and let your hips do their job before you take them out of the equation and force your back to do everything. 4.) Shoes off! I’m not saying taking your shoes off will increase your max by 100lbs, but if you are wearing a shoe that has more than a 1inch lift, think about going shoeless. The higher your shoe is the harder it will be to get close to the bar and lower yourself into a good position. 5.) Always practice good technique: Rather your warming up with a KB deadlift, 40% of your max, or hitting a PR, practice perfect technique and go through the same routine each time. Practice doesn’t make perfect, perfect practice makes perfect.